A most unusual sight (the snow that is)! SOLD 9/2007: 6/2008 new owners have completed a master bed & bath plus a den in the basement, enclosed a new room upstairs, and made it their own. We are building our new (SIP) home 3 blocks away! 2007 Update: we have lived here most comfortably since we moved in 8/28/99, and it just gets better! In the summer of 2006 we finally added a front porch and steps and installed the 1/2 glass front door bought in 1999. We got that exterior trim painted, and headed to Florida for the winter. Then this spring we completed an amazing number of tiny finish items we had quite lost track of, including: custom light fixtures for the bathroom, tile on the west ledge upstairs and completing phone and network connections in the wiring closet! Several rooms got fresh coats of paint, and some window seats got final finish work. We are still love our home BUT we want an ART studio space and workshop big enough for two painters and a sculptor (or is that 1 1/2 painters, and 1/2 a sculptor?) and a tiny house! We are selling! 2006 Update: After seven years, we actually do need a little maintenance: our south exterior trim needs repainting! This house is trouble free, warm, quiet and beautiful. Our moisture meter reads 0 at the four stations we bothered to test. We have completed missing interior trim (baseboards in the hall, door trim in the laundry room) and even filled all those pesky finish nail holes with matching filler! We have had a subtle, perfect cove of plaster to integrate the walls and ceiling in the bedroom and living room, so that it looks fabulous; really finished. In addition to the three tone paint job (with muted flying geese) in the main hallway, and a the complex flying geese wall mural overpainted by glaze in the stairwell, we now have two blue herons on the coat closet doors. This house is truly a home, and quite fabulous! Much of my time and energy is directed to art, but we do continue to enhance the house and garden. We are still missing two of four terraced retaining walls, a finished patio and a front porch. Our stack of cinder blocks and miscellaneous construction stuff is surely an eyesore for the neighbors. Our small Hearthstone propane heater keeps us cozy in the winters, and the flickering "fire" look is nice. It takes a while to bring the temperature up once it is allowed to drop 10-15 degrees. We have too many windows for a really energy efficient house, and in really cold weather the kitchen/dining room can be chilly, due to heat loss in the stick frame dining nook and the glass french doors (now better weather stripped). Using the (fabulous Hunter) ceiling fan helps, but insulated blinds would be a good addition. The clawfootless tub was fitted with a beautiful handmade wooden "cradle" to mimic the missing feet, during our first year, thanks to to our favorite houseguest, Gunnar Thompson! So how did we get in? Well, we went through the three worst days of the entire construction process with the stucco party from hell, but the inside straw was covered by two rather crude coats of hand-trowelled stucco by some seven hard working souls (including Michael and myself). We all have scars to prove it! The result was mostly not much better than adequate, and in some spots barely that. However, a final brushed on coat of cement/lime wash (with color) has smoothed out enough of the roughness, and the end result is really very soft, with texture and shadows! Artistic, especially with the fine variation of colors ... more detail available on this. We have put in wood trim (not TOO much), doors, light fixtures, cabinets, countertops, and flooring! A lot of work, many good ideas, many people, lots of good (and bad!) stories, and hours of time. The saga of the floors alone! Still, we have floors, we have cabinets (fine ones), and we live here! My partner and I have been planning on building our own home for over four years now. We have been getting serious about using straw bale for two years, and have plans from an architect who is familiar with straw bale building. We got our city building permit without difficulty, thanks to our experienced architect. We are building on the perfect lot in the perfect community (RoseWind Cohousing community) in the perfect city: Port Townsend, Washington. OK, maybe nothing is perfect, but so far so good! 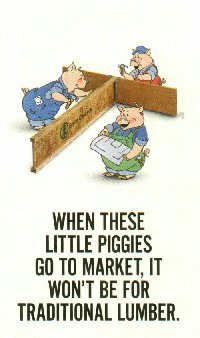 Not too many; and mostly related to our own lack of construction experience! We agonized over the details of the straw bale wall base "ladder", and chose to use black felt, 2"x4"s, and gravel. We kerfed the outer 2x4 with tiny saw cuts for drainage to the outside, and we hope that there will never be any water here to drain! We agonized over locating straw, and whether to pay for expensive "building quality" bales from last year or take pot luck on straw by the ton shipped direct from the field. We chose the latter, saving about $1.00/bale, and getting fine, dense, dry bales. We agonized over how to protect the walls from rain, but devised a fine system for the exterior of the walls with 6 mil clear plastic, using nails & furring strips at the top plate, and rolling and stapling the bottom of each 20' wide sheet to a 20' a 1"x4". Additional vertical 1"x4"s secure the overlaps, and the scheme is surviving our strong marine wind. We had two wonderful dry months (August and September), and could not have been luckier! STUCCO! Now there's the rub! For who would grunt and trowel, when he might a stucco gunner find? But we had quite a time locating a willing and affordable stucco gunner. We agonized over the possibility of a gun for hire, and assembling a crew of hourly workers and volunteers; but the risks, the planning, the confusion, the fear! The cost estimates ranged from $18,000 to $7,000, and took months to get. Still, all's well that ends well; we have stucco! So you may detect a pattern of agony in the above recital. We continue to agonize periodically, but have learned that we can and will work it out. So we plug on, and feel that we have the best possible of all houses (even though we consider ourselves pessimists). the house will not be a bit like the stick frame "spec" houses built all over America! The Solstice Straw bale Information Site, a short, focused set of links with serious information. 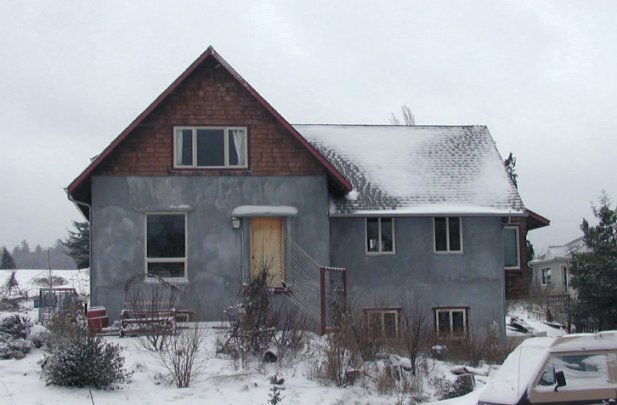 A good article about a specific house, with a lot of general straw bale information. A good photo display of construction stages. 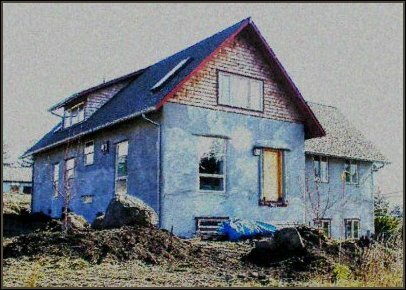 A straw bale Building Overview (and more) from B.C. A straw bale Builder's Site, these people do design/build with straw bale. The site provides photos, a fine FAQ, some good articles, and links (of course :-). 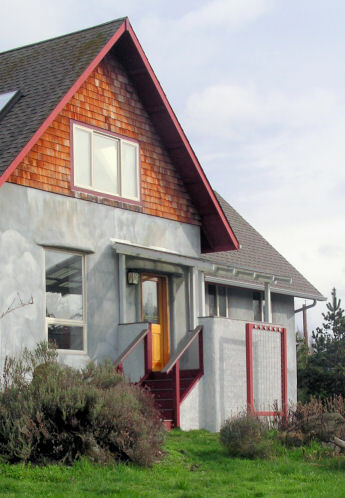 Terra Sol Design & Building is another straw bale builders site, located in Port Townsend, WA. The straw bale link page: Surfin' Straw bale, a huge and varied list of links; start here only if you have plenty of time to kill! Gary Shea's Straw bale Resource Page, this site will give you some history, some photos, an actively updated events list (go to the bottom for current info! ), and more. One Introduction to Straw Bale Culture, a slightly more quirky, personal page with all the basic book and mailing list information.